Improving capacity to detect and respond to food safety problems through: allocating inspection resources between domestic and foreign facilities and ports of entry; laboratory accreditation; tracking and tracing foods; mandatory recall authority, etc. Improving the safety of imported foods through: a foreign supplier verification program; authority to require import certifications; inspection of foreign facilities; third party auditors; etc. Miscellaneous provisions such as: funding for food safety; employee protections; jurisdiction and authorities; compliance with international agreements. plan for any corrective measures that may be necessary. On their side, staff at the FDA is working to establish science-based standards for testing. One area they are specifically focusing on is safe production and harvesting of produce. The Produce Rule is one part of this ongoing process. are allocated, utilizing a proactive, risk-based assessment process. The focus is on innovation with the goal of providing effective and efficient services. Should anything go wrong, the FSMA gives the FDA the right to issue a mandatory recall. Although historically most companies have been very cooperative when asked to implement a voluntary recall, this change is an important step in protecting the public health. In most cases, the Act gives dates of compliance based on the size of the operation and defines very small and small businesses. Very small businesses are given the longest time to reach compliance, small businesses slightly less time and the rest have the shortest time to comply. Finally, the legislation also recognizes the need for the FDA to partner with state, local, territorial and tribal authorities to enhance the food safety network. As well, the FDA is mandated to work with all of these authorities to provide food safety training, and it offers grants to help increase the number of labs and certified testing facilities. Companies are strongly encourage to become “FSMA ready” now to mitigate any risks associated with non-compliance, once the rules are finalized. 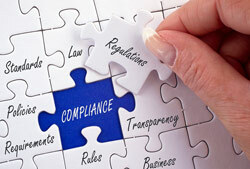 For more information on how meet compliance for the Food Safety Modernisation Act, please visit the FDA’s website.